The Sentry Lite is a lower cost version of the Sentry 73 however all the most important features are retained. The Sentry Lite has a single level setting, choice of linear or Bass weighting filter, security loop, remote reset facility, adjustable trip delay and built in microphone. A remote microphone connection with switchable phantom power is also provided. The threshold level using the built in microphone is adjustable between 70dB and 120dB. The trip delay once the limit has been reached is factory set a 20 seconds which generally is sufficient for the performer to see they are over limit and need to reduce their level, the delay can be adjusted down to 5 seconds or up to 45 seconds. 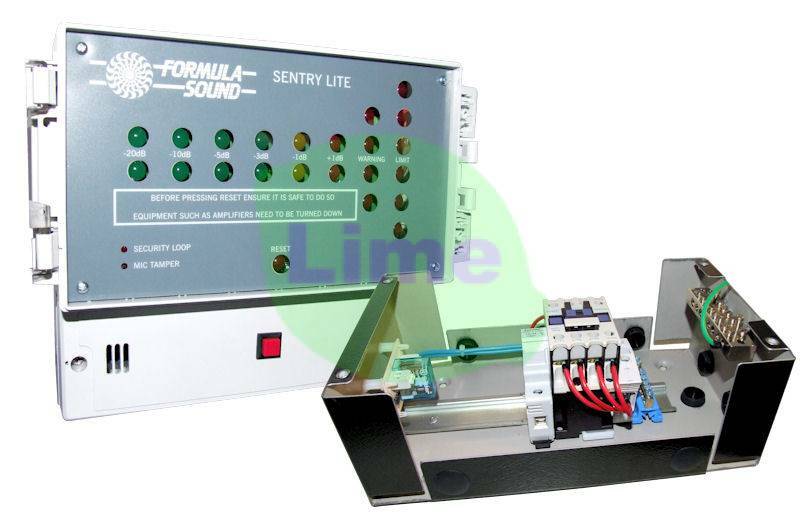 A dedicated Sentry Lite contactor in a separate box to control the mains ring is also included, the connection between contactor and display unit is a low voltage (low current <100mA) connection. A single adjustment behind the removable panel below the display sets the maximum sound level allowed, the display then indicates how close or far the actual sound level is from the level that has been set. The display also indicates if the unit has tripped, the security loop status and if the microphone has been tampered with. The Sentry Lite comes in two parts,the display unit and the contactor.This means the contactor can be installed by the fuse box and the display can be placed in the best position for the performer to see. This simplifies the installation into the mains ring and therefore lowers the cost. The contactor is connected to the display unit by a low voltage cable. The internal microphone is suitable for many applications, however there is provision to connect an external microphone. Setting of the threshold is by a multi turn potentiometer allowing a setting in the range 70dB - 120dB. Setting of the delay before tripping is by a potentiometer with a range of 5 - 45 seconds. A choice of linear or Bass weighting is selected on a jumper. The display indicates the sound level relative to the set threshold in 8 steps covering 23dB to give a clear picure of the sound level. The security loop allows interface to a fire alarm, emergency cut off switch or magnetic relays on fire doors among possible applications. The security loop status is indicated by an LED on the display. The microphone has tamper detection circuitry, an LED on the display shows the status. When the Sentry Lite trips there is a delay of 3 seconds before it can be reset. An LED on the display shows if the unit has tripped.